Learning how to make a braided rug can be an easy and satisfying project. It's a good activity to accompany watching television or listening to music. Just gather up your scraps or invest in some coordinated wool, cotton, or synthetic fabrics and start braiding. Want to find a useful way to recycle old sheets, curtains or slipcovers? Try braiding them into a useful rug instead of giving them away. 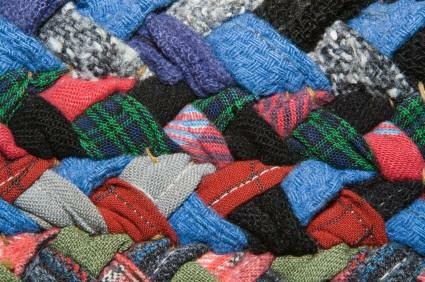 There are lots of methods for braiding rugs. You can leave fabric edges exposed and allow them to fray naturally for a homespun look, or turn the edges in, fold the strip in half, and stitch the seam in place for a more finished product. The look you want and the time you have to spend on the project will probably be the biggest determiners of which method you'll choose. For your braided rug project, start with a small rug, around 2' x 3'. Cut strips of fabric two inches wide along one of the straight edges, not on the bias. Even though it may look as though a nice long fabric strip will be more convenient, remember you'll be wrapping its entire length as you braid, so try to start with strips that are only three or four feet long. Stagger strip lengths. This way you won't add lot of bulk concealing knots and the tail ends as you cast on new strips. There are a couple of ways to add new strips, depending on what you're comfortable with. The more finished approach is to make a diagonal seam, either by hand or on a sewing machine. This distributes the bulk and makes a good strong connection. A faster way is to make slits on the tops and bottoms of the strips about a half inch from the end. They should be about a quarter of an inch long. Thread the new strip through the slit at the end of the strand you're working with, and then wrap the end of the new strip through its own top slit and pull. You'll be making a small knot and tying the two strips together. As you wrap the rows, these knots will disappear. Begin your rug by using a large safety pin to affix three fabric strips to something stable, like a bedspread, couch cushion, or pillow. One nice thing about using a pillow is that it's portable, so you can take your project with you from room to room. Start braiding, and then fold and hide the starter ends in the first two rows of the rug. Your braided rug will have to be tied to snug the rows and hold them in place. You can do this by either stitching rows together with a needle and thread, hiding stitches where the rows are adjacent to one another, or by tying the rug together with twine. Lengths of twine can be knotted over the rows the way you would tie a shoelace. Sewn stitches are less visible, but it can get tiring working the needle through multiple layers of fabric over the course of many rows. There is a lot of flexibility in how you can create a braided rug, but there are a few important things to watch out for as you work. The two most common mistakes are pulling the rows so tightly that the rug cups instead of staying flat around the outer edges, or tying the rows too loosely and creating a ruffled effect. To control both of these problems, place the rug on the floor after each round and check to make sure it's flat. If you check after every row, you'll save yourself having to rip rows out later. When you're coming around the last row, start to trim the widths of the last three strips of fabric, making the braid narrower. By the time you get to the end, the tail of the last strand should be easy to wrap under the previous row and stitch in place, making a smooth outer ring. Use the same amount of tension for all of your braiding. Looser and then tighter braiding will result in an uneven thickness and a sloppy look. Prewash all of your fabric to make sure that it's colorfast. Use only one type and thickness of fabric, like cotton, wool, or fleece. Match your thread or twine to the colors in your rug to help them blend into the background. Wrap tail ends of fabric strips and knots into the seams created by new rows. If tails look bulky, sliver cut them with a sharp pair of scissors. Braided rugs add country style and casual chic to a room. Although they can be expensive to buy, they are inexpensive to make. Learning how to make a braided rug is an easy and restful way to get into crafting. Rework a child's old play clothes or a husband's shirts into a floor covering and make a fun family heirloom.